One day, a storm ripped through the Mushroom Kingdom, blowing all the leaves from a special tree in Peach's garden. Bowser gathered the leaves and gave them to his armies, giving them Tanuki tails. The next morning, Mario arrived at Peach's castle to survey the damage when he discovered Bowser had kidnapped Peach. Mario sets off across the Mushroom Kingdom once again. 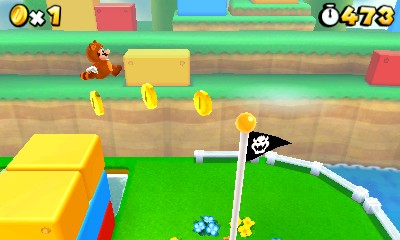 Super Mario 3D Land combines the 2D and 3D Mario games in an all new way. Mario must reach the goal in each stage's obstacle course to move on to the next. 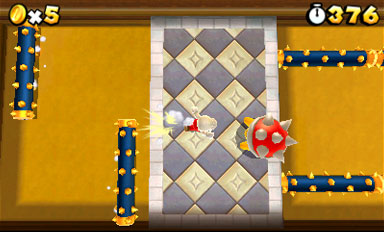 World 5-2 takes place in a birds-eye-view dungeon with rooms similar to the early The Legend of Zelda games. In one room, use the Fire Flower to light the torches and open a secret room and the Zelda "discovery" fanfare plays. The developers confirmed that this stage was included to celebrate The Legend of Zelda 25th Anniversary, which took place throughout 2011.